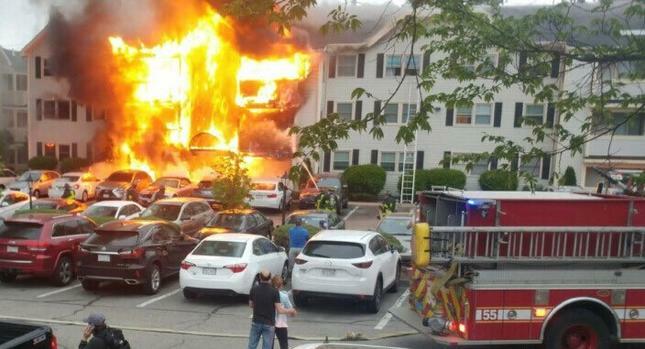 Nearly 70 residents across Boston were displaced by three separate fires Saturday morning. Boston firefighters went from fire to fire across the city, including one fueled by a gas leak that resulted in injuries to one resident and two firefighters. The three who were injured were taken by Boston EMS to area hospitals with non-life-threatening injuries. Thirty-six residents were displaced by that 6-alarm blaze at 1212 VFW Parkway in West Roxbury. There was heavy fire on arrival around 5:50 a.m. on three floors of the multi-unit apartment building. Boston Fire Commissioner Joe Finn was on scene when crews had to be removed from the building to maintain a defensive position by fighting the fire, which was contained to the unit of origin, from the exterior. Both National Grid and Eversource responded because of a gas leak that continued to fuel the fire, according to the Boston Fire Department. Firefighters continued to pour water onto the fire as National Grid worked to shut down the gas that was feeding the fire. The fire caused approximately $2 million in damages. While Boston firefighters were on scene in West Roxbury, a 2-alarm fire broke out in Dorchester around 8 a.m. Heavy fire was showing when the firefighters arrived at 3 Groom Street. Multiple rescues were made with residents taken out over ground ladders, according to the fire department. Twelve people were displaced by the blaze, but there were no reports of injuries. The fire, which was knocked down, started in the basement and burned through the rear stairwell, through the roof. Officials are estimating the fire caused $500,00 in damages. Prior to both the Dorchester and West Roxbury fires, firefighters also fought a 4-alarm fire overnight at 55 Dale St. in Roxbury. Nearly 20 people were displaced in the 6-family home, but no one was injured in the 3 a.m. fire. The fire caused approximately $500,000 in damages. The Red Cross and the Office of Neighborhood Services were notified to assist the 67 residents who were displaced by the three fires. All three multi-alarm blazes are under investigation.